One of the most exiting things of our time is to be witness to technologies that are in the Pioneering stage. Most people aged from 30 and upwards have seen technology evolved like no generation before. We have seen slow internet connections go from dial-up to 3G, ADSL, Wireless and Fiber. Each time the speed of the internet gets faster, more and more things become possible. These small advances in internet technology is opening more and more opportunities everyday. Virtual Reality is a old technology dating back to the early 1900’s. Although it was discovered and invented early there were a lot of things that made it impossible to be used by the masses. Small advancements in internet speed, display resolutions, smartphones getting smarter, smaller and more powerful is driving VR at lightning speed into becoming main stream. All the major companies like Google, Facebook, Microsoft, Samsung, HTC and the Oculus Rift company is investing a lot of money into virtual reality. These investments help with the development of VR projects, headsets, software and application like never seen before in the history of Virtual Reality. Google made the Google Cardboard device which is a cheap virtual reality headset that anyone can afford (these virtual headsets sell for as little as $15.00). Enabling anyone with a smartphone to experience a quality immersive virtual reality experience. Tonight for the first time in history surgeons are going to operate on a cancer patient, and the surgery is going to broadcast in 360° video. People with Google Cardboard Virtual Reality Headsets, the Samsung Gear VR headset or any other Google Cardboard Virtual Reality headset will be able to watch the surgery live. When popping-on the VR Glasses and watching the operation it would almost be the same as if you were standing next to the doctor performing the operation. The Virtual Reality headset allows you to view the surgery as if you were there. 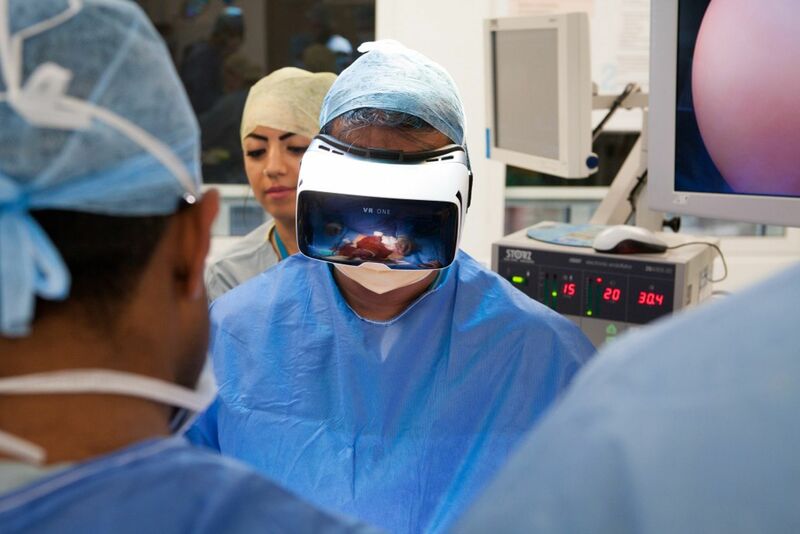 The surgeons, patient, nurses and medical team will appear similar sized as they would in the real world when watching through the glasses in Virtual Reality. People watching the operation will also have the capability to look at the things they want to instead of watching where the camera man is focusing. Dr. Ahmed, the man behind the knife making world history today with the live streaming of the surgery, sees this kind of technology as enabling remote education for doctors and surgeons in world wide and especially in developing countries. Surgeons across the globe, students and even ordinary people can sit in on the surgery and see how it is done. Doctors and medical students can learn from the operation, and see exactly what the operation entitles. Ordinary people can go into the surgery without fear of contaminating the surgery. In fact millions of people can go into the surgery by using Virtual Reality which would have been impossible if in the real world. It can even be something extrodinary to see for the patient. As he can later see exactly what the surgeons done. Tonight’s surgery could be result in one of the biggest advances in the medical field this decade and we see it as one of potentially the most important steps in using technology in the medical field. With this technology a surgeon can remotely assist in future operations, and by being there in virtual reality help safe lives. To get a feeling of the Surgery happening today (14 April 2016) you can watch the video below. In this video you can watch a prerecorded operation in 360° video and virtual reality. Two 360-degree cameras will catch the gory details as Dr. Ahmed works on a 70-year-old patient with cancer of the colon, sending the footage to a dedicated app called VRinOR, available now for free in the Google Playand App Stores. VR viewers using Cardboard or Gear VR will be able to switch between these cameras in real time as Dr. Ahmed and his team of surgeons work, but you’ll also be able to watch along on the app even if you don’t have a headset, tilting your smartphone to look around the room as you would turn your head. A 360-degree video of the operation will be available for web browsers. On April 14 April 2016 The first live 360° video streamed surgery took place. Using Google Cardboard and your own phone you could have joined Medical Realities during this global educational experience and watch the surgery being performed live as if you were there. World class education was available to anyone across the world as they streamed the surgery in 360 degree high-definition from within a surgical theater. Members of the public, students and surgeons alike could have viewed the surgery on their own devices, and through the use of Google Cardboard entirely immerse themselves in the operating environment.